That guy ought to say he's sorry for making a catastrophic sign. If "Where's your sorry?" 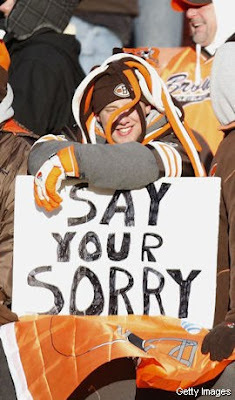 is okay, why not "Say your sorry"? I just noticed a space between the YOU and the R. And also the YOU seems bolded while the R is not. So maybe the fan wrote "SAY YOU R SORRY" in a hurry. Why should I say I'm sorry? You're the one who messed up the sign!